Do I have to schedule events in advance? Any events that require facilitators (team building challenge course, zipline, rock wall, archery, etc) must be scheduled at least 1 week in advance. 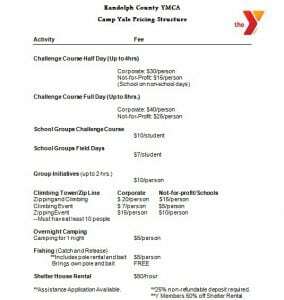 Call us at (765)584-9622 or email Jackie Welch, Camp Yale Director, at jackierwelch@gmail.com to schedule an event. 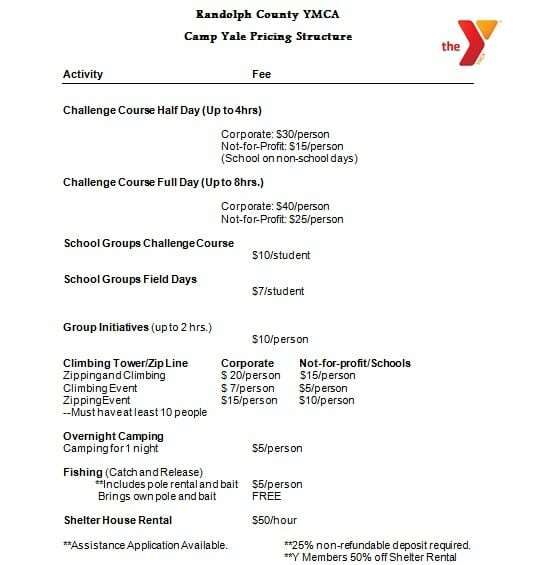 What are Camp Yale’s Hours of Operation? Facilitated Hours are available from March-October as scheduled by groups. Walking trails and disc golf are open year round from dawn to dusk. How many team building elements can my group complete in one day? This depends on each individual group. Some groups are able to complete all elements during their team building event, but it is not unusual for groups to not complete every element. This gives a group something to look forward to for their next visit to Camp Yale! Can I camp at Camp Yale? You can tent camp at Camp Yale for $5/person/night. You would have access to our restrooms with showers, fire pit, and shelter house. You can also park campers in our parking lot for $30/night.